NSQ’s design pushes a lot of responsibility onto client libraries in order to maintain overall cluster robustness and performance. This guide attempts to outline the various responsibilities well-behaved client libraries need to fulfill. Because publishing to nsqd is trivial (just an HTTP POST to the /put endpoint), this document focuses on consumers. By setting these expectations we hope to provide a foundation for achieving consistency across languages for NSQ users. At a high level, our philosophy with respect to configuration is to design the system to have the flexibility to support different workloads, use sane defaults that run well “out of the box”, and minimize the number of dials. A consumer subscribes to a topic on a channel over a TCP connection to nsqd instance(s). You can only subscribe to one topic per connection so multiple topic consumption needs to be structured accordingly. Using nsqlookupd for discovery is optional so client libraries should support a configuration where a consumer connects directly to one or more nsqd instances or where it is configured to poll one or more nsqlookupd instances. When a consumer is configured to poll nsqlookupd the polling interval should be configurable. Additionally, because typical deployments of NSQ are in distributed environments with many producers and consumers, the client library should automatically add jitter based on a random % of the configured value. This will help avoid a thundering herd of connections. For more detail see Discovery. An important performance knob for consumers is the number of messages it can receive before nsqd expects a response. This pipelining facilitates buffered, batched, and asynchronous message handling. By convention this value is called max_in_flight and it effects how RDY state is managed. For more detail see RDY State. Being a system that is designed to gracefully handle failure, client libraries are expected to implement retry handling for failed messages and provide options for bounding that behavior in terms of number of attempts per message. For more detail see Message Handling. Relatedly, when message processing fails, the client library is expected to automatically handle re-queueing the message. NSQ supports sending a delay along with the REQ command. Client libraries are expected to provide options for what this delay should be set to initially (for the first failure) and how it should change for subsequent failures. For more detail see Backoff. Most importantly, the client library should support some method of configuring callback handlers for message processing. The signature of these callbacks should be simple, typically accepting a single parameter (an instance of a “message object”). An important component of NSQ is nsqlookupd, which provides a discovery service for consumers to locate the nsqd that provide a given topic at runtime. Although optional, using nsqlookupd greatly reduces the amount of configuration required to maintain and scale a large distributed NSQ cluster. When a consumer uses nsqlookupd for discovery, the client library should manage the process of polling all nsqlookupd instances for an up-to-date set of nsqd providing the topic in question, and should manage the connections to those nsqd. The broadcast_address and tcp_port should be used to connect to an nsqd. Because, by design, nsqlookupd instances don’t share or coordinate their data, the client library should union the lists it received from all nsqlookupd queries to build the final list of nsqd to connect to. The broadcast_address:tcp_port combination should be used as the unique key for this union. A periodic timer should be used to repeatedly poll the configured nsqlookupd so that consumers will automatically discover new nsqd. The client library should automatically initiate connections to all newly discovered instances. When client library execution begins it should bootstrap this polling process by kicking off an initial set of requests to the configured nsqlookupd instances. Once a consumer has an nsqd to connect to (via discovery or manual configuration), it should open a TCP connection to broadcast_address:port. A separate TCP connection should be made to each nsqd for each topic the consumer wants to subscribe to. an initial RDY count of 1 (see RDY State). If the consumer is configured with a specific list of nsqd instances, reconnection should be handled by delaying the retry attempt in an exponential backoff manner (i.e. try to reconnect in 8s, 16s, 32s, etc., up to a max). If the consumer is configured to discover instances via nsqlookupd, reconnection should be handled automatically based on the polling interval (i.e. if a consumer disconnects from an nsqd, the client library should only attempt to reconnect if that instance is discovered by a subsequent nsqlookupd polling round). This ensures that consumers can learn about nsqd that are introduced to the topology and ones that are removed (or failed). nsqd responds to the IDENTIFY command with a JSON payload that includes important server side configuration values that the client should respect while interacting with the instance. The feature_negotiation field indicates that the client can accept a JSON payload in return. The client_id and hostname are arbitrary text fields that are used by nsqd (and nsqadmin) to identify clients. heartbeat_interval configures the interval between heartbeats on a per-client basis. More detail on the use of the max_rdy_count field is in the RDY State section. Once a consumer is in a subscribed state, data flow in the NSQ protocol is asynchronous. For consumers, this means that in order to build truly robust and performant client libraries they should be structured using asynchronous network IO loops and/or “threads” (the scare quotes are used to represent both OS-level threads and userland threads, like coroutines). Additionally clients are expected to respond to periodic heartbeats from the nsqd instances they’re connected to. By default this happens at 30 second intervals. The client can respond with any command but, by convention, it’s easiest to simply respond with a NOP whenever a heartbeat is received. See the protocol spec for specifics on how to identify heartbeats. Due to their asynchronous nature, it would take a bit of extra state tracking in order to correlate protocol errors with the commands that generated them. Instead, we took the “fail fast” approach so the overwhelming majority of protocol-level error handling is fatal. This means that if the client sends an invalid command (or gets itself into an invalid state) the nsqd instance it’s connected to will protect itself (and the system) by forcibly closing the connection (and, if possible, sending an error to the client). This, coupled with the connection handling mentioned above, makes for a more robust and stable system. Because these errors are most often timing issues, they are not considered fatal. These situations typically occur when a message times out on the nsqd side and is re-queued and delivered to another consumer. The original recipient is no longer allowed to respond on behalf of that message. When the IO loop unpacks a data frame containing a message, it should route that message to the configured handler for processing. The handler indicates that the message was processed successfully. The handler indicates that the message processing was unsuccessful. The handler decides that it needs more time to process the message. The in-flight timeout expires and nsqd automatically re-queues the message. In the first 3 cases, the client library should send the appropriate command on the consumer’s behalf (FIN, REQ, and TOUCH respectively). The FIN command is the simplest of the bunch. It tells nsqd that it can safely discard the message. FIN can also be used to discard a message that you do not want to process or retry. The REQ command tells nsqd that the message should be re-queued (with an optional parameter specifying the amount of time to defer additional attempts). If the optional parameter is not specified by the consumer, the client library should automatically calculate the duration in relation to the number of attempts to process the message (a multiple is typically sufficient). The client library should discard messages that exceed the configured max attempts. When this occurs, a user-supplied callback should be executed to notify and enable special handling. If the message handler requires more time than the configured message timeout, the TOUCH command can be used to reset the timer on the nsqd side. This can be done repeatedly until the message is either FIN or REQ, up to the sending nsqd’s configured max_msg_timeout. Client libraries should never automatically TOUCH on behalf of the consumer. If the sending nsqd instance receives no response, the message will time out and be automatically re-queued for delivery to an available consumer. Finally, a property of each message is the number of attempts. Client libraries should compare this value against the configured max and discard messages that have exceeded it. When a message is discarded there should be a callback fired. Typical default implementations of this callback might include writing to a directory on disk, logging, etc. The user should be able to override the default handling. Because messages are pushed from nsqd to consumers we needed a way to manage the flow of data in user-land rather than relying on low-level TCP semantics. A consumer’s RDY state is NSQ’s flow control mechanism. As outlined in the configuration section, a consumer is configured with a max_in_flight. This is a concurrency and performance knob, e.g. some downstream systems are able to more-easily batch process messages and benefit greatly from a higher max-in-flight. When a consumer connects to nsqd (and subscribes) it is placed in an initial RDY state of 0. No messages will be delivered. bootstrap and evenly distribute the configured max_in_flight to all connections. never allow the aggregate sum of RDY counts for all connections (total_rdy_count) to exceed the configured max_in_flight. never exceed the per connection nsqd configured max_rdy_count. the # of connections is dynamic, often times not even known in advance (ie. when discovering nsqd via nsqlookupd). To kickstart message flow a client library needs to send an initial RDY count. Because the eventual number of connections is often not known ahead of time it should start with a value of 1 so that the client library does not unfairly favor the first connection(s). Additionally, after each message is processed, the client library should evaluate whether or not it’s time to update RDY state. An update should be triggered if the current value is 0 or if it is below ~25% of the last value sent. The client library should always attempt to evenly distribute RDY count across all connections. Typically, this is implemented as max_in_flight / num_conns. However, when max_in_flight < num_conns this simple formula isn’t sufficient. In this state, client libraries should perform a dynamic runtime evaluation of connected nsqd “liveness” by measuring the duration of time since it last received a message over a given connection. After a configurable expiration, it should re-distribute whatever RDY count is available to a new (random) set of nsqd. By doing this, you guarantee that you’ll (eventually) find nsqd with messages. Clearly this has a latency impact. The client library should maintain a ceiling for the maximum number of messages in flight for a given consumer. Specifically, the aggregate sum of each connection’s RDY count should never exceed the configured max_in_flight. Each nsqd is configurable with a --max-rdy-count (see feature negotiation for more information on the handshake a consumer can perform to ascertain this value). If the consumer sends a RDY count that is outside of the acceptable range its connection will be forcefully closed. For backwards compatibility, this value should be assumed to be 2500 if the nsqd instance does not support feature negotiation. When consumers configure max_in_flight > 1, due to variable num_conns, there are cases where max_in_flight is not evenly divisible by num_conns. Because the contract states that you should never exceed max_in_flight, you must round down, and you end up with cases where the sum of all RDY counts is less than max_in_flight. Consider the case where only a subset of nsqd have messages. Because of the expected even distribution of RDY count, those active nsqd only have a fraction of the configured max_in_flight. The is_starved method should be used by message handlers to reliably identify when to process a batch of messages. The question of what to do when message processing fails is a complicated one to answer. 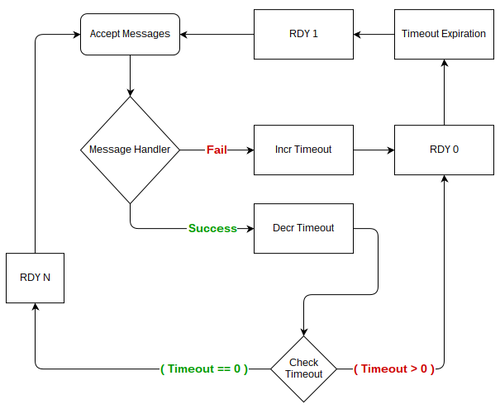 The message handling section detailed client library behavior that would defer the processing of failed messages for some (increasing) duration of time. The other piece of the puzzle is whether or not to reduce throughput. The interplay between these two pieces of functionality is crucial for overall system stability. By slowing down the rate of processing, or “backing off”, the consumer allows the downstream system to recover from transient failure. However, this behavior should be configurable as it isn’t always desirable, such as situations where latency is prioritized. Backoff should be implemented by sending RDY 0 to the appropriate nsqd, stopping message flow. The duration of time to remain in this state should be calculated based on the number of repeated failures (exponential). Similarly, successful processing should reduce this duration until the reader is no longer in a backoff state. While a reader is in a backoff state, after the timeout expires, the client library should only ever send RDY 1 regardless of max_in_flight. This effectively “tests the waters” before returning to full throttle. Additionally, during a backoff timeout, the client library should ignore any success or failure results with respect to calculating backoff duration (i.e. it should only take into account one result per backoff timeout). NSQ supports encryption and/or compression feature negotiation via the IDENTIFY command. TLS is used for encryption. Both Snappy and DEFLATE are supported for compression. Snappy is available as a third-party library, but most languages have some native support for DEFLATE. After confirming that tls_v1 is set to true (indicating that the server supports TLS), you initiate the TLS handshake (done, for example, in Python using the ssl.wrap_socket call) before anything else is sent or received on the wire. Immediately following a successful TLS handshake you must read an encrypted NSQ OK response. In a similar fashion, if you’ve enabled compression you’ll look for snappy or deflate being true and then wrap the socket’s read and write calls with the appropriate (de)compressor. Again, immediately read a compressed NSQ OK response. These compression features are mutually-exclusive. The interactions between the various components of an NSQ cluster work in concert to provide a platform on which to build robust, performant, and stable infrastructure. We hope this guide shed some light as to how important the client’s role is. Message - a high-level message object, which exposes stateful methods for responding to nsqd (FIN, REQ, TOUCH, etc.) as well as metadata such as attempts and timestamp. Connection - a high-level wrapper around a TCP connection to a specific nsqd, which has knowledge of in flight messages, its RDY state, negotiated features, and various timings. Consumer - the front-facing API a user interacts with, which handles discovery, creates connections (and subscribes), bootstraps and manages RDY state, parses raw incoming data, creates Message objects, and dispatches messages to handlers. Producer - the front-facing API a user interacts with, which handles publishing. We’re happy to help support anyone interested in building client libraries for NSQ. We’re looking for contributors to continue to expand our language support as well as flesh out functionality in existing libraries. The community has already open sourced many client libraries.